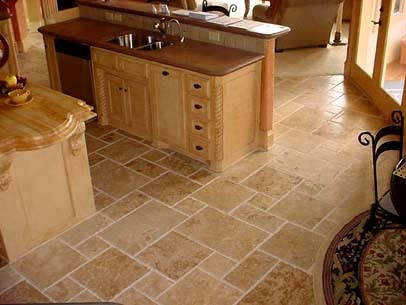 This warm travertine flagstone with its worn and rounded edges lends iitself to that old fashioned English kitchen. It aquires a rich patina over time and is very popular farmhouse kitchen floor, more rustic in feel to the Light Travertine. Tip ! Often rather than using an Ivory Grout on its own, try blending it with a Beige grout to get a softer feel to the floor.